Did you know that latkes have a Middle Eastern origin? They are an Ashkenazic Hanukkah specialty, but of course could be eaten at any time of the year. They are “truly marvelous and a good way to start any meal, or to accompany roasted beef” says Yotam Ottolenghi in his cookbook Jerusalem written with his friend Sami Tamimi. What I like about this recipe (from this book) is that besides potatoes it also uses parsnips. If you leave out the chives and reduce the amount of salt, you can serve them sweet, sprinkled with sugar. After peeling and grating the potatoes, rinse in cold water, drain, squeeze out as much liquid as you can, and dry them completely (use a clean kitchen towel). Peel and grate the parsnips, and in a large bowl mix them together with the potatoes, chives, egg whites, corn starch, salt and pepper. Heat the oil and half of the butter in a frying pan. Gather about two tablespoonfuls of the potato mixture with your hand, form little patties, squeeze them a little bit, and fry them on medium-high heat for about 3-4 minutes on each side (or until they look golden – be patient, don’t flip them often, the inside needs to be cooked through). Remove the latkes from the oil to a plate lined with a paper towel, and keep them warm. Continue cooking adding to the pan the rest of the butter and oil as needed. Serve with sour cream either as appetizer or a lite main meal. If you use a bigger frying pan, the cooking could be done quickly. 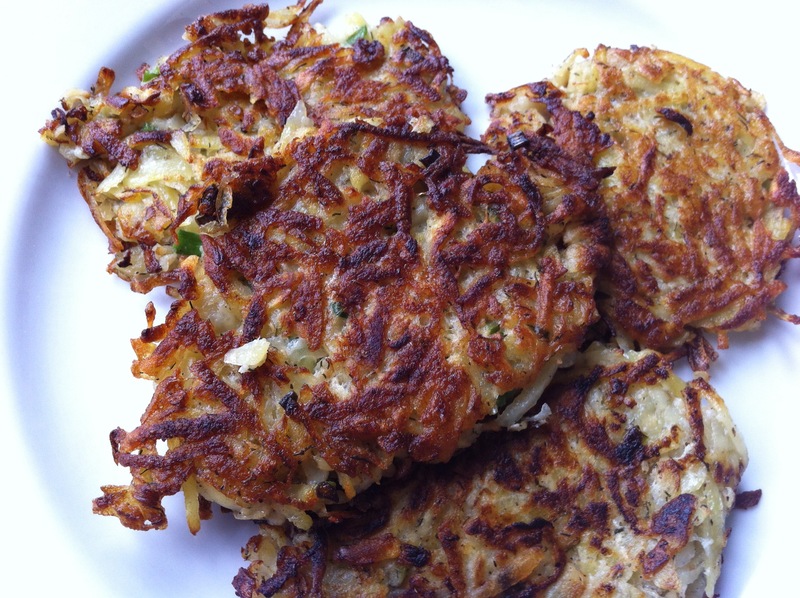 I was able to fry them in two batches making 12 latkes. Use waxy potatoes like Yukon Gold. Yum! I love latkes and just recently learned that my family is part Ashkenazi. Your recipe looks delicious. I will have to give it a try. My new discoveries are the cookbooks of Ottolenghi, a chef in London. He has many very simple and tasty recipes.